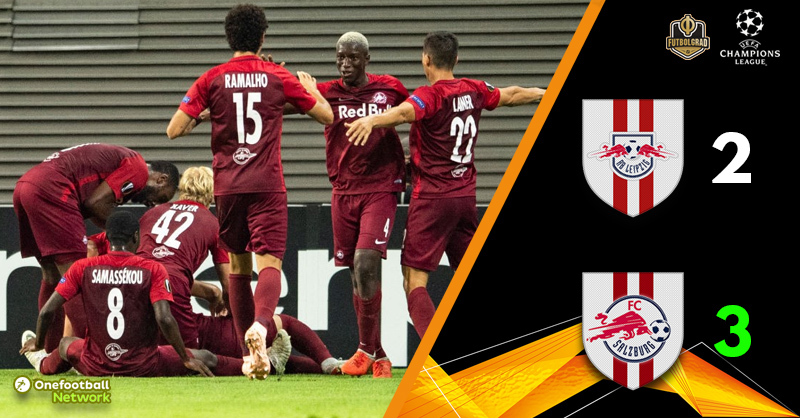 RB Leipzig vs FC Salzburg, the Red Bull derby – even with the decision from UEFA that both teams are ‘suitably independent’ the similarities were evident. From kit styling, to the way the Austrian’s outplayed their opponents in a display that was ‘Leipzigesque’. Last season Borussia Dortmund were embarrassed by Austrian champions Red Bull Salzburg – renamed on a UEFA night to FC Salzburg due to advertising restrictions. Would the visitors from the ‘other Bundesliga’ cause another upset inside the home of a fellow Red Bull product? Yes – they most certainly would. In a dull opening encounter there was more fascination in how the clubs are linked, or not – than the brand of football that was on display. That changed very quickly as the game passed the quarter mark, a defensive implosion allowed Salzburg to score twice in two minutes. Firstly, Munas Dabbur and then Amadou Haidara made the Leipzig center back pairing of Nordi Mukiele and Dayot Upamecano look amateurish. To a backdrop of whistles the visitors flew into a commanding lead. Ralf Rangnick looked livid, and rightly so. As the first half was brought to a close without any additional time, Leipzig looked dreadful in Europe once again. As the teams came back out for the second half, the substitution board was held aloft. You can only imagine the type of conversation that took place in the Leipzig dressing room with three changes on the horizon. Yussuf Poulsen came on for Jean-Kévin Augustin – the french striker had been anonymous. Marcel Halstenberg replaced Brazilian Matheus Cunha while Bruma made way for Diego Demme – the winger another who was unable to affect the game in any positive way for the German side. With an hour played, the changes had made no real difference for Rangnick’s men – in fact the closest to a goal since the restart fell to Dabbur – hitting the post with a shot across Mvogo. In a game dominated by mistakes it was no surprise that Leipzig’s lifeline came via a Salzburg error. Andreas Ulmer didn’t know whether to kick or head the ball – he did neither and Konrad Laimer drilled the ball home. The Leipzig goal opened the game up, it suddenly became an end to end fixture – from staring at a defeat the hosts then began to look for an equalizer, it came with eight minutes remaining. Kevin Kampl delivered a cross that Yussuf Poulsen dispatched with ease, the Saxony side had found the goal their late play deserved. There was to be a late-late sting in the tail for the German side, just as they looked to be pressing for a winner. The back four of Leipzig once again looked disjointed and this time there would be no reprieve. Hannes Wolf broke quickly and played in Fredrik Gulbrandsen, the Norweigen forward kept his cool under immense pressure and sent the traveling bench wild as the Austrian’s snatched the late win. Heavily linked with a move to Leipzig in the summer the Maili international was a constant thorn in the Leipzig back line. An easy tap-in capped a wonderful opening twenty minutes. Even when Leipzg pulled themselves back into the game it was Haidara who remained the biggest threat to the scoreline. Leipzig have built a reputation on playing quality football – a high press with fast transitions have born some wonderful football since they reached the Bundesliga back in 2016. Tonight, they looked a shadow of themselves until the 70th minute. With little to no control across any areas of the pitch they showed that when not at full strength they struggle to compete – squad depth will once again raise its head.